In the past month and a half Andrew has lost 3 of his 4 top teeth. I keep teasing him that if he looses any more we're going to have to blend all his food up and have him drink it from a straw :-) Lucky for him it looks as though at least one new tooth is coming in so maybe he will be able to keep eating like a "normal person". On Halloween we went over to the Sutterfield's house, otherwise known as our friends Steven and Becky. We trick or treated their neighborhood with the kids and then came back to their house for some great food. I have to say this has been one of the best October's we have had in a while. We are so lucky to have met so many great people here in Kansas. Ok I have no idea why the two pictures above are stuck together like that, but I can't seem to fix them. The top one is Adam with Ava's hat and wig on. The bottom one is Ava waiting until it's time to go trick or treating. The Friday before Halloween (can you tell we had a crazy busy week leading up to Halloween?) 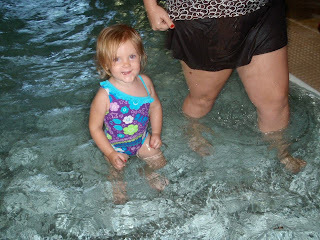 we headed on over to Kansas City to stay at the Great Wolf Lodge. In case you have never heard of it, the Great Wolf Lodge is a hotel that has its own indoor water park that is only available to hotel guests. We went there to celebrate our neighbor Luke's 11th birthday. The kids were out of school that day so we got there around noon so that we could play in the water as much as possible. 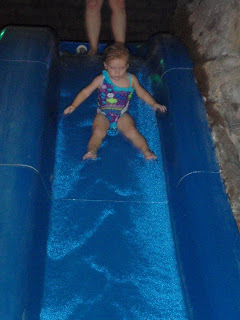 All of the kids had a blast including Ava. In fact both of my kids overcame a fear that day. 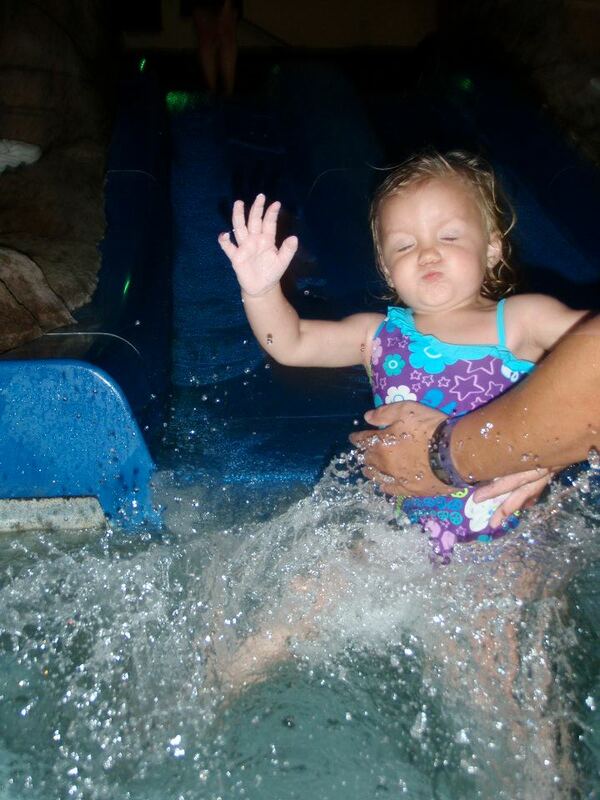 Andrew finally decided to try going down a water slide (he's been terrified for the longest time) and Ava decided it was ok to put her face in the water and get splashed. We spent about 5 hours playing in the water before getting ready for dinner. After we finished playing in the water park everyone headed up to our rooms to get ready for dinner. We decided to eat at the restaurant in the hotel so that the kids to participate in everything the lodge had to offer. Since it was so close to Halloween they had trick or treating throughout the main level of the building. Around 8:00pm they had story time for all of the kids in the lobby which was followed by a costume parade and finished up with a 2hr dance party complete with contests. The boys had a blast. I missed the dance party because I had to go put Ava in bed. She had been all day without a nap and somehow managed to not meltdown one single time. I was so proud of her and when she started to fuss at 8:30 I promptly took her upstairs and laid her down. Ava wasn't really interested in her costume that night so knowing that she had not napped I decided not to force it. This is the only picture I got of the boys because they were too busy running all over the place. Can you tell they were annoyed we made them sit down and wait on Ava? All in all we had a great night. It was definitely expensive but I think it is something we will do again on special occasions in the future. It was fun getting to celebrate Luke's birthday with him. We are so lucky to have neighbors that have become not only our best friends but also like a 2nd family to us. A pie in the face you say? As I mentioned in my past post, the night of the trunk or treat the 3 platoon Sgts were auctioned off. Every now and then members of the "command group" are auctioned off as a way to raise money for the FRG. The money raised is generally used for company parties or functions. Anyways, that night it was the platoon sgt's turn. The soldiers live for these nights because it is their turn to get their leaders. Each Sgt is auctioned off individually and the one who brings in the most money get the biggest pie. Apparently Adam's soldiers really like him because he not only brought in the most money, but his bid also set a new battalion record at $325. Below are pictures of Adam and Steven (one of our good friends) getting their pies. I missed getting pictures of the 3rd SGT, but I have him at the end. Enjoy!! I just love how you can see the pie falling down his face. Looks yummy don't you think? I was laughing so hard at this point. The Wednesday before Halloween Adam's company had a Trunk or Treat. Adam, the kids and I all got dressed up. We were an interesting group to say the least :-) The kids had lots of fun and got tons of candy. It was a little cold and windy that night so we tried not to stay outside for too long. Once the trunk or treat was over the FRG (family readiness group) had a quick meeting and then they auctioned off the platoon sgts, this included Adam. I will go into more detail about this in another post. It is hysterical! Did you know that Olive Oil and Katy Perry were friends?